Packing for a backpacking trip involves the careful balance of selecting the necessities and letting go of luxuries. You want to make sure that you have all the gear and food you need to be comfortable and safe BUT you want your pack to be as light as possible. So what do you sacrifice? Some people choose to eat only dehydrated food, others go without a stove, while a few go ultralight and bring only minimal gear. Whisky around the campfire or a post-dinner cocktail may seem like excess but I would like to argue that they are backpacking essentials (OK - not ESSENTIAL, but they are really nice additions to any trip). When I arrive at camp after miles on the trail, I always look forward to a special drink to celebrate my hard day’s hike. I asked my friends to share some of their favorite backcountry drink hacks and scoured the internet for ideas to taste test the next time I’m on the trail. Remember though, it is REALLY important to stay hydrated when you’re hiking. If you choose to drink alcohol on the trail, make sure you consume enough water. One more safety note: hiking in the backcountry requires awareness and good judgment. Never hit the trail intoxicated (a sprained ankle can spell disaster) and always ensure you are SAFE and AWARE of your surroundings. Hands down, whisky is my go-to drink for the backcountry. The weight to alcohol ratio makes this an easy choice for multi-day trips. Whisky is best enjoyed room temperature, so you don’t have to worry about trying to find a way to keep it cool. One drink only weighs 1.5oz so you can bring enough for a few days (or a few people) without adding excess weight. Some of my favorite summer memories include sitting around the campfire sipping whisky under the stars. For a special occasion, I like to kick things up a notch and bring some good Single Malt Scotch but really, anything is delicious when you’re exhausted. My favourite these days is a 12 year old Highland Park, it is delightfully smoky but not overwhelming. If you don’t like to drink straight whisky, pack a few tea bags and some brown sugar - this is a delicious drink enjoyed hot or cold (I skip the brown sugar and use Good Earth Sweet + Spicy tea). You can also pre-mix a whisky cocktail directly in your flask. Check out this article for ideas and some things to consider before packing a flask cocktail. Speaking of flasks, I usually travel with my Stanley Flask, which carries enough whisky to share or to last for a few nights. Another lightweight option is to fill up some disposable flasks (you can re-use these a few times to reduce waste). On my gear wishlist this year is the 10oz VSSL Utility Flask, which comes with a built in flashlight, compass, and shot glasses - perfect for surviving a rough night on the trail! After whisky, I’m most likely to enjoy wine on the trail. Red wine is an excellent choice since it doesn’t require refrigeration and can turn a bland camp dinner into a rich dining experience. Of course, I always drink red wine in moderation, as I find it tends to dehydrate me more quickly than other alcohol. The easiest way to transport wine is in a bag. Forget heavy bottles - buy a box of wine and leave the box at home. When you have drank all the wine, you can blow up the empty bag to use as a pillow (thanks to friends at Reddit for that camping hack!). If 4L of wine is too much, you can make a smaller bagged wine by filling a bladder or collapsible water bottle (choose one that you no longer use for water because I find that it’s hard to remove the taste of wine). The PlatyPreserve was specially formulated by MSR to be leakproof and prevents wine from picking up a plastic taste. ​I always drank wine out of my coffee cup - until someone gifted me these Silicone Wine Glasses. They are lightweight, unbreakable, and classy (I also came across this glow-in-the-dark version, which I may just need to buy for myself!). Another great option, if you prefer stemware, is the GSI Nesting Wine Glass - the stem unscrews and tucks conveniently into the cup. Strapping a six-pack to your backpack isn’t a great idea, although I have definitely seen it done (and may have even done it myself a time or two). Honestly, after hiking on a hot day, there's nothing I crave more than taking off my sweaty hiking boots and cracking a beer. There is no denying it though - beer is heavy. My compromise is that I pack a tall can for my first night in camp and then sip whisky for the rest of the hike. I only pack beer when we're camping near water. When we get to camp, we place our beers in a mesh bag with a long drawstring and add some rocks to weight them down. We submerge this makeshift cooler in the lake, tying the string to a rock or tree on shore. By the time camp is set up and dinner is ready, our beers are cool enough to drink. It is even better if you have access to running water or some glacier run-off to cool things down quickly. ​Another great beer option, if you’re camping with a group, is the Hydro Flask growler. Get it filled at your favorite local craft brewery and it will stay carbonated and cold for up to 24 hours. Concentrated backcountry beer is something I have always wanted to try! I heard good things about Pat’s Backcountry Beverages, but they are no longer in business. If anyone knows of a new concentrated beer product that is available, please let me know in the comments below. Do read the comparison for insulated bottles tho! They'd work perfectly fine for alcoholic drinks as well: Hydro Flask vs Yeti. One friend I hike with INSISTS on carrying a beer for the summit. Even if they have to carry the beer for a few days, up steep terrain, they claim that they cannot enjoy their accomplishment without having a beer to toast the sky. Personally, I prefer to leave a cooler full of ice and beer in the truck, so that I can celebrate the end of the trail with a cold one (but don’t have to carry it in my pack for miles). If you do bring beer on the trail - NEVER BRING GLASS BOTTLES. In addition to the weight, the potential for breakage and debris on the trail is too risky. Always remember to leave no trace. Pack out your empty cans (and store them in your food barrel or bear bag overnight - not near the tent, lest you attract bears). For a real treat, pack yourself a camp cocktail! BarCountry Pocket Cocktails are an easy and lightweight way to enjoy a fancy drink on the trail. These dehydrated cocktail mixes come in Margarita, Bloody Mary, Old-Fashioned, and Moscow Mule - just add water and liquor. Pocket Shots are a great option for packable liquor. 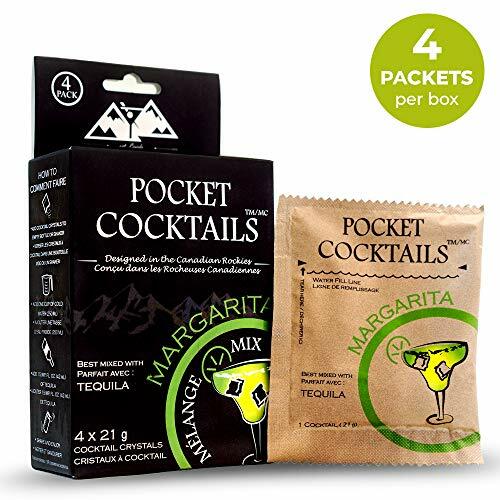 They are individually packed in 1.7oz pouches - you can get Vodka, Spiced Rum, Cinnamon Schnapps, and more. A friend of mine packs her spirits in these HydraPak soft flasks, which come in a variety of sizes (she brings the 150ml ones). KRU82 also sells “adventure worthy vodka” in a stainless steel bottle that you can clip to the outside of your pack (and then use for water when the vodka is gone). I'm excited to try out this idea from Reddit for my next short summer hike (I think the extra weight will be worth the reward!) A couple of days before the hike, freeze a package of Margarita mix in a ziploc (with Tequila added). Keep it in a cooler on ice until you hit the trail then put it in the top of your pack (you can also use it to keep food cool for the first day of the hike). By the time you arrive at camp, it’ll be just slushy enough to make the perfect Margaritas! The options are endless really! Be creative and let me know about your cocktail ideas in the comments below (I am always looking for inspiration!) If you are winter camping - use snow in place of ice! Another practical reason to bring alcohol to the backcountry is for an alcohol stove. Ultralight backpackers sing the praises of this lightweight, affordable cooking option. Normally, denatured alcohol (methylated spirits) is used as fuel but sometimes people bring Everclear. Advocates of Everclear note that its 95% alcohol is useful for wound cleaning, fire starting, fuel, and entertainment. The high alcohol concentration in Everclear does mean that a little bit goes a long way (so you can lighten your pack load by bringing a small amount of alcohol). If you do bring Everclear to drink, be VERY CAREFUL to monitor your alcohol consumption to avoid alcohol poisoning in the backcountry. Drink lots of water! Regardless of how much you drink, dehydration is always a concern. Be careful to drink enough water while you hike - especially if you’re consuming alcohol. Alcohol and altitude don’t mix. Consuming alcohol can inhibit your ability to adapt to elevation changes. Don’t drink and hike. Wait until you get to camp before partaking. On the trail, you need to be alert and aware in order to avoid dangerous situations. Don’t store alcohol in your tent (even empties). Regardless of whether your beer is in cans or your whisky is in a flask - store it with your food in a barrel or food hang in order to prevent bears/wildlife at your campsite. ​Leave no trace! Pack out whatever you bring in - flatten beer cans or rinse out disposable flasks and carry them back to civilizations. Always leave the trail and your campsite better than you found it! I hope this post was fun and informing for you. Thank you for reading and happy trails.